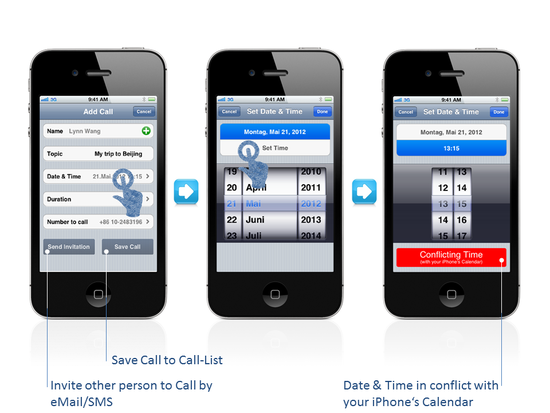 To start adding phone calls to your Call-List on the "Calls"-Tab, press the "+"-Tab. In case you only wish to save the Call in your Call-List, press "Save". The Call will appear in the Call-List. In case you wish to invite the other person for a Phone call via eMail (SMS if contact has no eMail-address), press "Send Invitation". As long as the other person has not answered your request, the Call will be stored in the "Pending"-Tab.